The Blackmagic Design OpenGear SDI Distribution Converter is a converter in the form of a rack mount card that's compatible with the 20-slot 2RU OpenGear racks. It sits on two slots and can share the rack with converters made by different manufacturers. It is hot-swappable and so can be pulled out of the rack at any moment without the prerequisite of the rack first being powered off. The SDI distribution converter, referred to also as an SDI DA, with "DA" short for "distribution amplifier", takes one SDI input and automatically distributes up to 9 SDI outputs, with up to 3Gbps supported on both the in and outs. The converter inputs and outputs video and 16 channels of embedded audio. 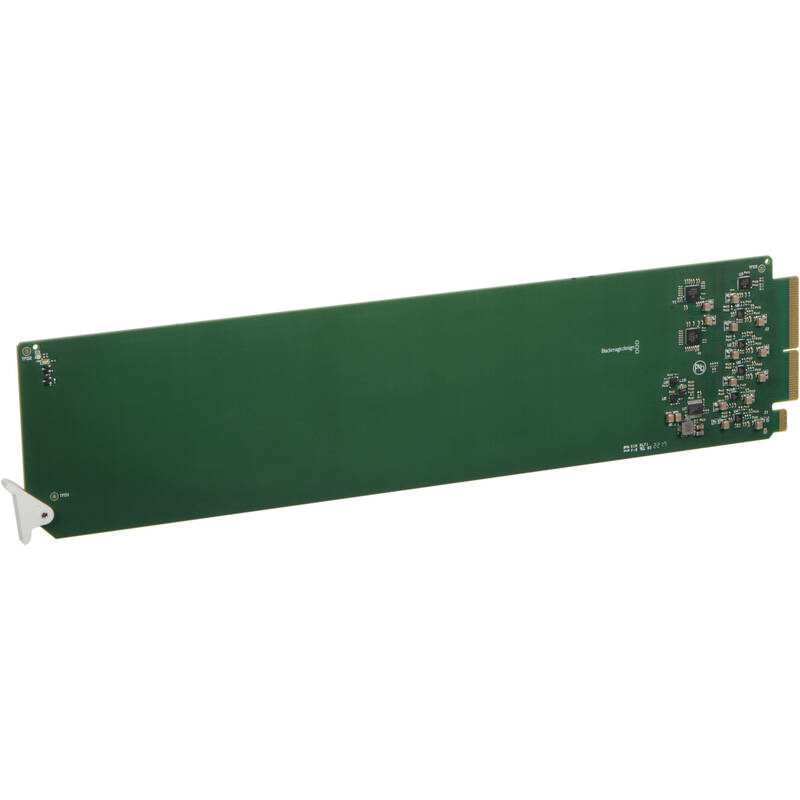 The converter features re-clocking distribution, re-clocking the incoming signal so the output can run at the full 300' that SDI has capacity for. The cables required are 75 ohm SDI cables, which are not included. Aside from traditional data formats, the SDI DA accepts the ASI format and can thus transfer compressed, and it also accepts ancillary data such as timecode, closed captioning, and other data that's outside of the visible raster. OpenGear-compatible rack mount card SDI converter. Supports one SDI input and automatically distributes up to 9 SD/HD/2K/3G-SDI outputs. Inputs and outputs 16 channels of embedded audio. Sits on 2 slots of 20-slot 2RU frames and is hot-swappable. Can work in the same rack as converters made by different manufacturers. Re-clocks distribution to output at full 300' SDI capacity. Accepts ASI format and supports ancillary data. Box Dimensions (LxWxH) 15.8 x 3.5 x 1.5"
OpenGear SDI Distribution Converter is rated 5.0 out of 5 by 1. Rated 5 out of 5 by Nickname here from Great converter for the money I use the converter to feed multiple t.v. 's a 1080i signal with embedded audio. This product works great and is very plug and play. My only problem is they are very volatile when it comes to power surges - we have everthing on battery backup protection but it seems with every power failure the outputs start dying. Are these DAs still capable of driving the dual back card? 1 x 9s are extreme overkill for this project, but I do need 1 x 4s. The only back end card that this can use is the one that it comes with. It has not been tested with any dual back cards and it is not recommended that you use one on it.